The drive from the west coast of Tasmania to Hobart, Australia’s second-oldest capital city, is one of the most beautiful journeys in the world. The weather was fine and clear but quite cold when we set off from Strahan on the west coast early in the morning. We made good time to Queenstown and decided to stop at a lookout above the town. The views were spectacular and I could imagine it with a dusting of snow. It would be so beautiful. We continued on our way to the Franklin-Gordon Wild Rivers National Park. Famous for the wild, stunningly beautiful rivers that twist through the wilderness, the park is also famous for its mountain peaks, rainforest, and spectacular gorges. We stopped at the Nelson River and took the walk down to Nelson Falls. It wasn’t far and we set off along a timber boardwalk through some of the most beautiful rainforest we’d ever seen. How amazing! How absolutely spectacular! 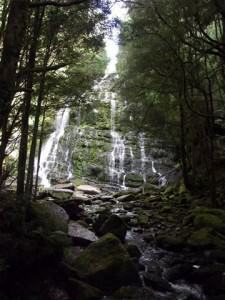 The walk through the rainforest was simply breathtaking but the falls were magnificent! I had read somewhere that the falls resembles an upside-down wineglass and I must say that is a very apt description. 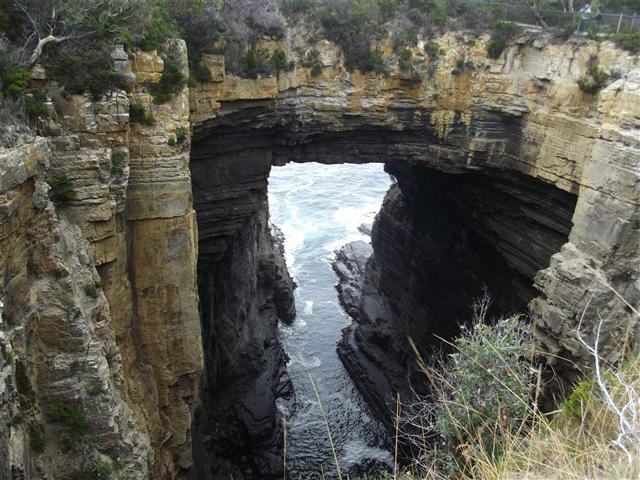 The water tumbles down a 30 metre (98 feet) drop to the rocks below and flows into the Nelson River. I was captivated and didn’t want to leave but, as John pointed out, we couldn’t stay there all day and so we wandered back through the rainforest and were soon back on the road. The Franklin-Gordon Wild Rivers National Park is 117 kilometres (73 miles) west of Hobart and is in the heart of the Tasmanian Wilderness World Heritage Area. It is named after the two main rivers lying within the boundary of the park, the Franklin River and the Gordon River. If we’d had more time I would have loved to explore more of the park. Maybe next time. We left the national park and decided to stop for lunch at Tarraleah but when we were still about 13 kilometres (8 miles) out we came around a bend and there before us was Bradys Lake! What a beautiful setting! 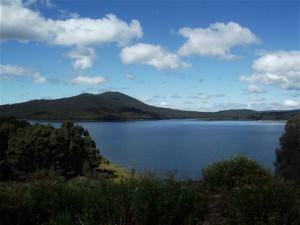 The mountains rising over the lake with a few houses dotted around the shore in a lakeside, bushland setting. We drove around the lake and through the small settlement before reluctantly taking our leave of this lovely place and, after a quick stop at the Teez Café in Tarraleah for lunch, arrived at the Treasure Island Caravan Park ([star][star][star]) in Berriedale just before 4:00. 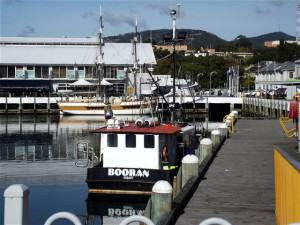 187 kilometres (116 miles) and the estuary portion flows for another 52 kilometres (32 miles) out to sea and forms the Port of the City of Hobart, the deepest, sheltered harbour in the southern hemisphere. 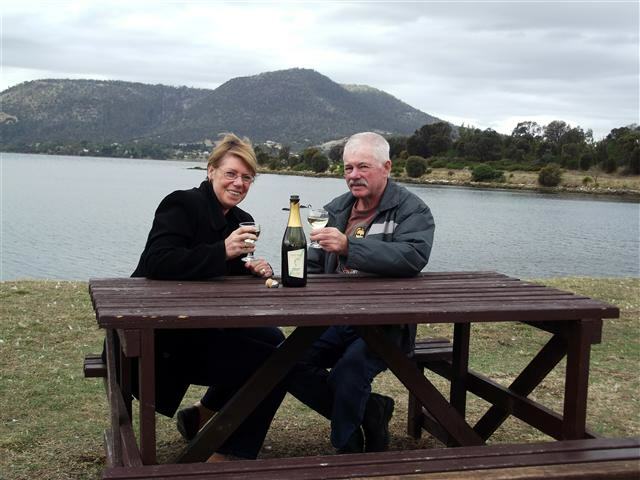 But this evening we toasted our arrival here in Australia’s southernmost capital and the Two Tails went down a treat before the night chill settled into the air and we adjourned inside the cabin. It was a particularly cold start the next morning but the day warmed up nicely. In fact by lunch time it was really quite warm. We drove down into Hobart to the harbour and our first port of call was the information centre where we picked up brochures and pamphlets on things to see and do in Hobart. After we left the tourist centre we wandered down to the waterfront. I simply couldn’t come to Hobart and not visit Constitution Dock where the Sydney-Hobart race ends. Along with Victoria Dock, Salamanca Place, and Battery Point, the dock forms part of the foreshore of Sullivan’s Cove. How exciting it must be to stand here and greet the yachts as they sail into the dock. For a while we wandered around the Kings Pier Marina, mostly so John could look at the boats. There were a lot of boats moored there and he was enjoying himself immensely. We watched a huge catamaran come into the Elizabeth Street Pier and her master made the docking look easy. I bet he’s the kind of guy who could reverse park an 18-wheeler without batting an eyelid! At the far southern end of the Waterfront Precinct we stopped for coffee at a café called Blue Skies. Overlooking the water, it had a relaxed atmosphere and even though it was not quite 10:30, it was very busy. After coffee we decided on a drive down to Sandy Bay. We caught glimpses of the Derwent River where it meets the Southern Ocean and I managed one photograph but there was nowhere to stop, let alone park along the route. But with the sun shining and very few clouds, it was beautiful. 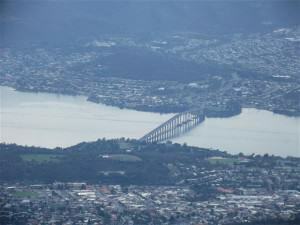 We drove through Sandy Bay and on towards the town of Kingston. the only remaining circular, sandstone shot tower in the world. 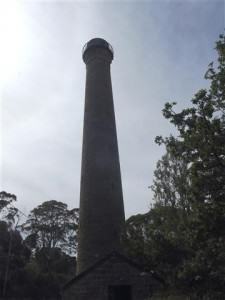 The lead was melted in cauldrons at the top of the tower and droplets of molten lead became spherical as they dropped into a tub of water at the base of the tower. The top of the tower is accessed by a circular staircase of 259 steps for anyone with the energy to make the climb. We didn’t. 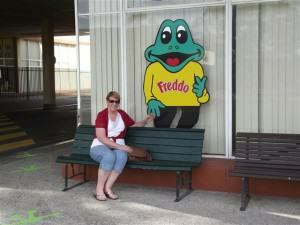 After a brief stop at the Wrest Point Casino where John wanted to have a look inside the gaming rooms, we drove down to Claremont to the Cadbury’s Chocolate Factory. By this time it was close to closing so we’d missed the tour but we did hit the chocolate shop instead. My chocoholic hubby was determined to enjoy himself. This factory is the largest chocolate factory in the southern hemisphere but John wasn’t interested in the history of the place. You’ve heard the expression “kid in a candy store”? Enough said. All the chocolates are about half the price you would pay in the shops but factor in the $7.50 entry fee per person and it’s not that cheap. Still, we came away with a bagful for John – it will last him until he’s 70 (at least! ), I’m sure! The temperature drops rapidly once the sun goes down and a quick stroll along the riverbank after dinner was very quick indeed before we scurried back to the relative warmth of our cabin. The next morning we set off for the Cascade Brewery, Australia’s oldest operating brewery. The old building, from the early 1800’s, overlooks the entire complex and even appears to be standing guard in its position at the end of the road. 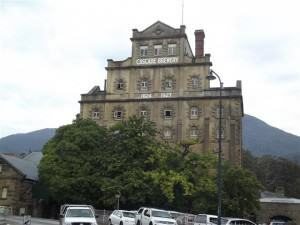 The brewery had a rather inauspicious start, beginning its life in 1824 in the Old Hobart Gaol. Its founder, Peter Degraves, was serving time for not paying his debts when he dreamed up a beverage made from the waters of the Cascade streams. Inside the main visitor area is a modern restaurant area and a souvenir shop and this leads out to some stunning gardens. We were too early for the tour, and way too early for any tasting, so we wandered around the museum for a while. John was fascinated by the 8 different types of Cascade Beer available for sale here, none of which are available outside Tasmania. The gardens are stunning and somewhere to sit in the peace and quiet but a light shower of rain had us scurrying back indoors. The brewery was more for John than me, I wanted to visit Mt Wellington and so after leaving Cascade we drove up to the Pinnacle more than 1220 metres (4000 feet) above sea level. Mt Wellington is often referred to as a “wilderness within reach of the city” and the 21 kilometre (13 mile) drive to the summit takes you through some amazing countryside, including temperate rainforest and sub-alpine flora. It was overcast so the views from The Pinnacle were somewhat less than spectacular but it was certainly amazing. 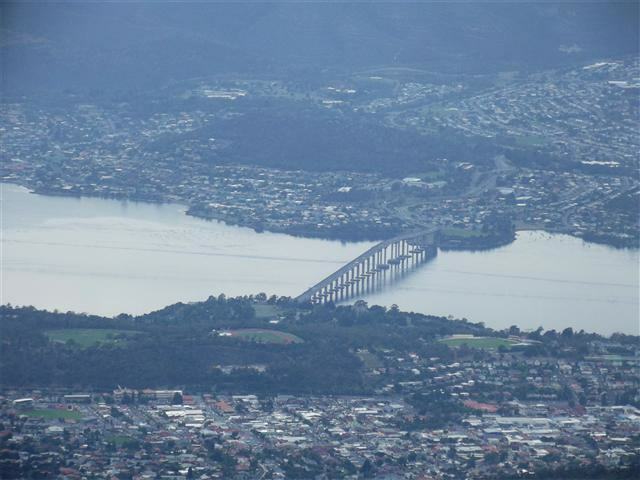 The panoramic views of Hobart, Bruny Island, and the Tasman Peninsula just took our breath away. 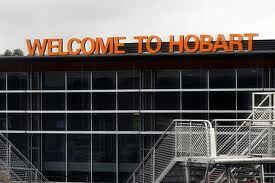 The windiest place in Hobart! told that the road had been blasted from rock in 1932 around the same time as the Sydney Harbour Bridge was built. The wind was fairly howling while we were there and it was really cold and it came as no surprise to learn that this is the windiest place in Hobart. There is an interpretation centre at the top but it was closed when we were there. Something to do with the aforementioned workmen. The mountain has been known by several names since it was first sighted by Europeans in the late 18thcentury and didn’t receive its present name until 1832 when it was named in honour of the Duke of Wellington after his defeat of Napoleon at the Battle of Waterloo. Not one of the better ones! By now it was lunch time and we left the mountain and made our way to the suburb of Glenorchy. Something simple for lunch was all we wanted and we found a place called The Central Food Court. This was quite possibly the worst lunch we had ever eaten – anywhere! Everything, even the chips, was pre-cooked and simply reheated in the microwave. It was truly revolting. On a scale of 1-10? -4! 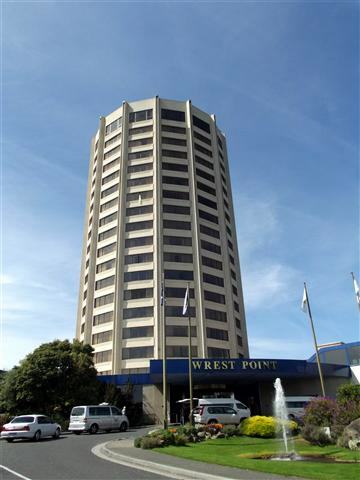 We returned to camp for a catch-up afternoon – emails home, laundry, that sort of thing, and this evening set off for the Wrest Point Casino. Now, we’re not gamblers and neither one of us had a clue how some of those games were played but John was fascinated with the roulette tables and watched some fellow who seemed to be winning a lot! But, as we both agreed, we didn’t know how much he had lost to get to this point. We wandered off to the cashier’s counter and had a chat to the man there and he explained a few things but, quite frankly, it went over my head. But we couldn’t come here and not have a go so we took up seats in front of a poker or slot machine and, last of the big spenders, decided to invest $5.00. Well, the machine hungrily ate our $5.00 note like a starving man and we started pushing buttons. Every once in a while lights would flash and bells would sound and when we’d had enough we pushed the “collect” button. On counting our winnings we discovered that we’d not only got our $5.00 back but another $10.00 on top! We decided not to have dinner at the casino but to head down to the waterfront where we stopped at Constitution Dock at a little fish café called Mako. It’s not much more than a takeaway shop with a few tables and chairs, it’s not 5-star, in fact it probably wouldn’t rate a star at all, but it has the best, the freshest fish and chips we’d had in a long time! The young man who served us, Till, was pleasant, friendly, and helpful and for us it was the perfect end to the day. only 400 metres (1312 feet) long and 30 metres (98 feet) wide at its widest point but it is home to some stunning natural formations including the Tasman Blowhole, Tasman’s Arch, and Devil’s Kitchen. We stopped for here for a while and wandered along the path through the rugged terrain. I especially wanted to see the Arch; many people believe it is man-made but it has, in fact, been caused by erosion. We left the Neck after about an hour and continued on our way to Port Arthur. The Port Arthur Historic Site remains today a symbol of the convict system. But it was much more than just a prison, it was a community, home to military personnel and free settlers alike. The weather was not promising at all and remained overcast for the whole day which was fitting. Knowing that it was once a feared penal station, somehow bright sunshine and blue skies wouldn’t have seemed right. The history was fascinating. In the early 1800’s English law deemed that at the age of 7 a boy, or girl for that matter, was legally responsible for their own actions and so could be tried as an adult for anything from misdemeanors to serious crime and by the age of 9 could be legally transported. There was actually a separate prison built on Point Puer, an island in the harbour, called the Boy’s Prison. Some 3000 boys, some as young as nine, were sent here between 1834 and 1849. We followed the guide map around several of the ruined structures still standing today. Some I found oppressing and in one or two could actually “feel” a presence. Whether by accident or design, Icouldn’t say; there is a ghost tour after dark so I’d be more inclined to say it was by design to get people in but . . . who knows? We toured through the main penitentiary, the law courts, the guard tower, and the commandant’s house, the only fully furnished, intact building on the site. We also visited the hospital, the asylum (that was fun . . . not! ), the separate prison, and the pauper’s depot. Apparently it was a crime to be poor or a beggar, as well. Harsh times, indeed. it was only a short walk to the dockyard and then on to the jetty for the harbour cruise part of the tour. Shipbuilding was one of the main industries on Port Arthur and during its 15 years of operation this dockyard produced 16 large decked vessels and approximately 150 small open boats. 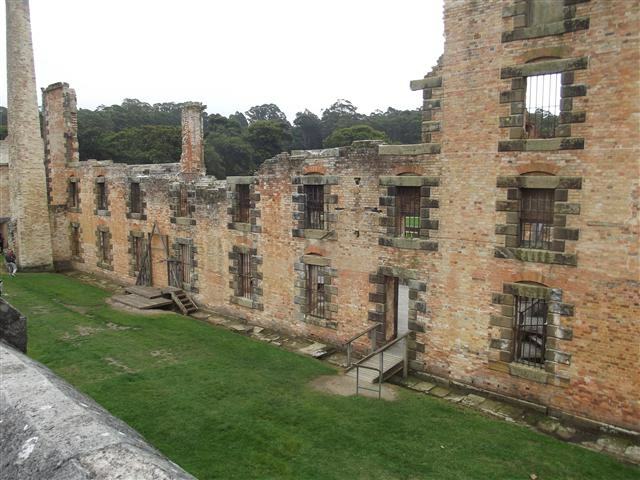 At its peak some of the convicts worked here. 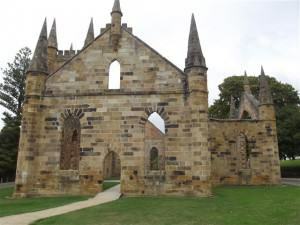 Our cruise took us past the Isle of the Dead, Port Arthur’s cemetery, where more than 1100 people, convicts, settlers, and military, were buried between 1833 and 1877. Many of the gravestones are still visible today. We also cruised past Point Puer Boys Prison. But now the rain was really coming down and when the boat docked we decided to call it a day. We had planned on a stop at the Tasmanian Devil Conservation Park on our way back from the Peninsula but the rain was coming down, the wind was rising, and the temperature had fallen dramatically. No, it was definitely time to leave and head back to the cabin where we listened to the heavy rain on the roof for most of the night. Everything you always wanted to know about trout! The next afternoon we (John) decided we would like to visit the Salmon Ponds Trout Farm, the southern hemisphere’s oldest trout hatchery, at New Norfolk so off we went to check it out. Began in 1861 it was the birthplace of trout in Australia and is owned by the Inland Fisheries Service. To say I was a little disappointed, though, was an understatement. There were some staff members sitting at a table in the reception area but they were busy with their coffee or glasses of wine and it wasn’t until John reminded them that we’d paid for the “privilege” of taking this tour that they handed us a map of the complex and said “have a nice day”. Unimpressed? You bet! And the trout farm, set in beautiful gardens though it might be, was a bit of a waste of time, as well. But I must point out that that is only my opinion. I can’t see how anyone could find a bunch of fish swimming in ponds to be interesting, let alone fascinating, but John seemed to be enjoying himself. 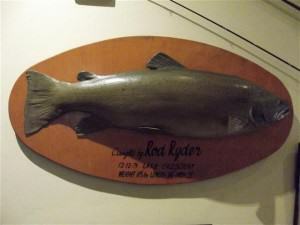 Close to the southern entrance is the Tasmanian Angling Hall of Fame. This is a wonderful tribute to the pioneers of trout fishing in Tasmania, and others who have made a significant contribution to Tasmania’s world renowned trout fishery. There is also a museum which I did enjoy but most of the hatchery was, to me, uninspiring, at best. Quite frankly if fishing is not your thing then this isn’t the place for you. The Ponds do boast some beautiful gardens that are a rare example of 19th century English parks and public spaces. Quite a lot of the trees there are over one hundred years old. It was late in the day when we returned to the cabin and began packing up. Our brief, too brief, stay in Hobart had come to an end and it was time to move on but I know we’ll be back some time and I hope it’s soon.